Dedicated to bringing you quality, tasty, yet affordable Mexican fare, MexOut has opened its second store to much anticipation in Marina Boulevard. At first sight, MexOut catches your eye with their eye-popping colour combinations, enticing you to come inside. 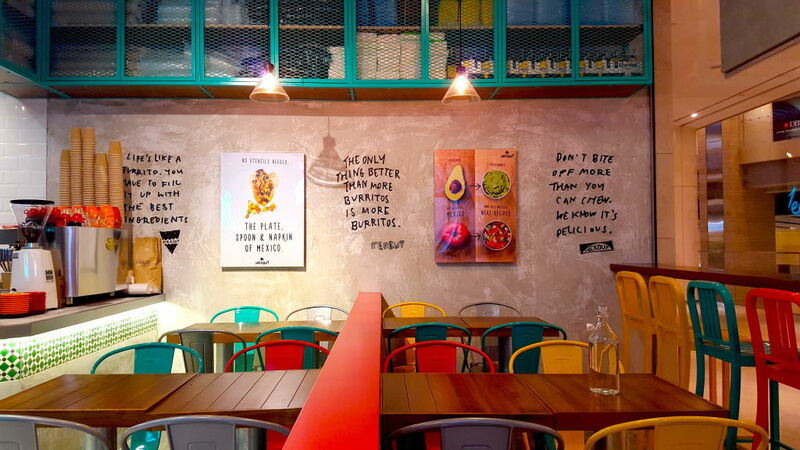 The walls are also decorated with cheeky quotes revolving around burritos, and are a quirky touch that instantly brings smiles to faces. 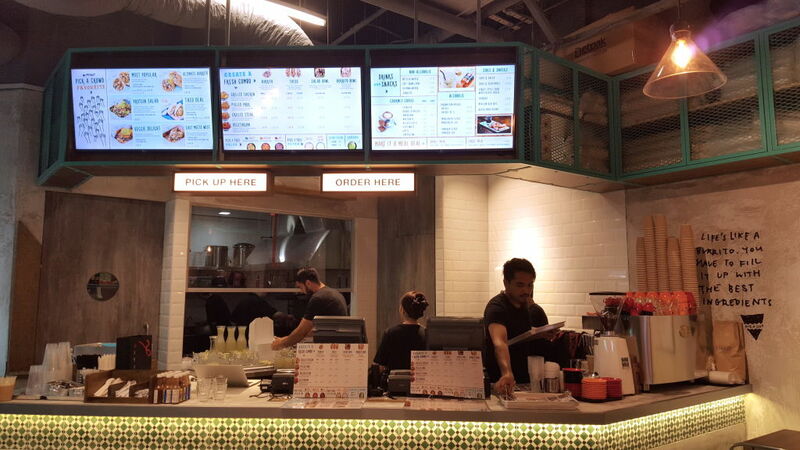 Instead of picking your food as you go along the counter (like in the original MexOut store), the second outlet has restructured their kitchen so that you are able to pick off their menu or try one of their carefully-crafted options. 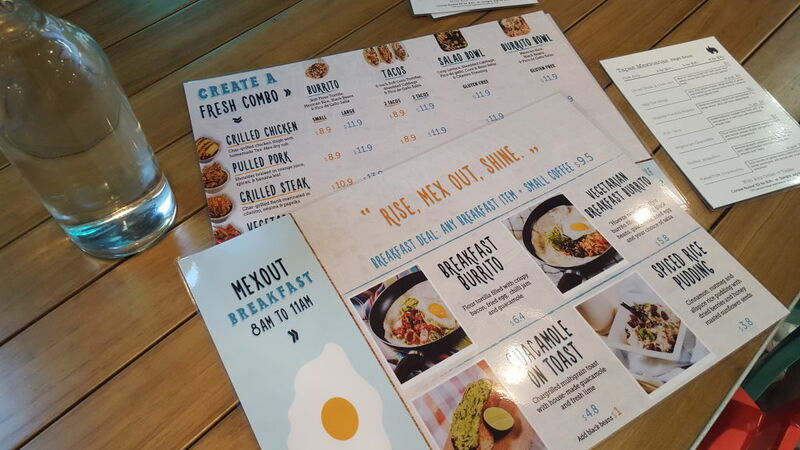 Hopping onboard the healthy bandwagon, MexOut has introduced a new breakfast menu, bringing new combos and Vegetarian options. Start off your day with the Breakfast Burrito, a flour tortilla filled with crispy bacon, fried egg, chilli jam, and guacamole. The menu is targeted at people who want a lighter meal to start off their day, and includes items like Guacamole Toast and The Breakfast Burrito. Those who need your morning coffee can also grab a cup from their new coffee range, specially roasted beans from a partnership with Sarnies. If breakfast isn’t your thing, spark your creative juices by fashioning your own personal combo of a burrito, taco, salad, or burrito bowl! Options include the Char-Grilled Chicken with homemade Tex-Mex dry steak, Pork Shoulder Braised in orange juice, spices and banana leafs, and Char-Grilled Flank Steak marinated in cilantro, onions and paprika. Finish off with freshly-made salsa, or cheese and sour cream. You can also choose to add their homemade guacamole which adds a fresher, lighter spin to your meal. Guac-lovers would be able to taste the delectable freshness of the avocado, which isn’t overpowered by the cilantro, onions, and spices. With a range of beers, Sangria, and Magaritas on the menu, MexOut has pushed out a new Nights Bites menu. Any of the tapas can be ordered separately, or mixed-and-matched at 3 tapas for $21, 5 for $30, or 6 for $35. 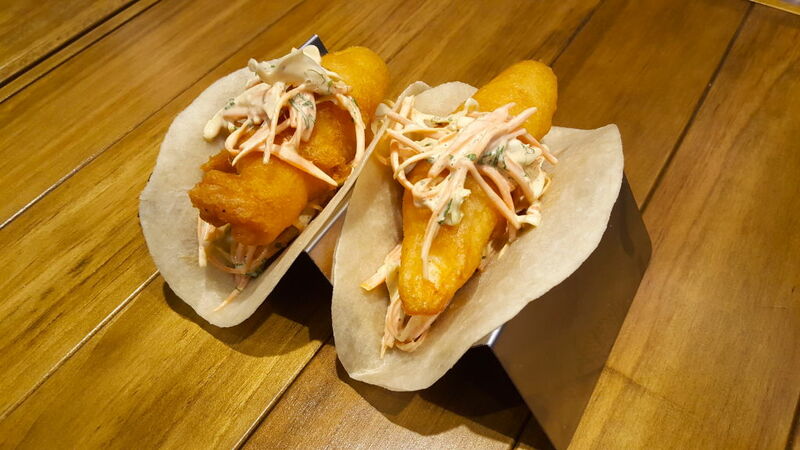 The Fish Taco was a golden battered fillet paired with creamy coleslaw, kind of similar to fish-and-chips in a taco. Like a meal all rolled into one for convenience, the comfort food is messy but so worth it. Another excellent food pairing that tasted surprisingly good was the Pulled Pork Tacos topped with sweet mango and pineapple salsa. The sweetness of the salsa allowed you to savour the pork flavour more intensely. The best dish of the night, however, went to the Sliced Steak and Chilli Jam. Char-grilled to perfection, the tender NZ flank steak was topped with spiced chilli jam that stole the limelight from the steak itself. 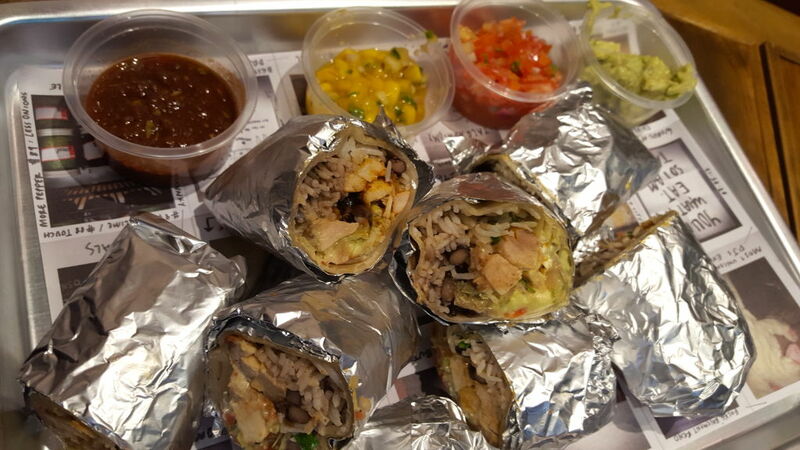 Convenient and easy on the wallet, MexOut brings you Mexican food with its own little twists of flavor. For those who don’t have time to spare, MexOut also delivers around the area to bring you that delicious Mexican goodness to keep you going! This was an invited media-tasting. 8am to 9pm, Mondays to Fridays. Breakfast menu only offered at the Marina Boulevard branch.